Tis the season for lists of gifts for gardeners. There are lots of tools and books that make great gifts, but for cold-climate gardeners, you have some special choices. Here are three any northern gardener would love. Photo courtesy of Meshed. Jumpsuits fit intentionally lose. I was the lucky winner of this mosquito-proof jumpsuit from Meshed at the Garden Bloggers Fling in Austin, Texas, in May. The suit is made of a mesh material and is designed as a nontoxic way to keep mosquitoes, ticks and other nasties off your skin while gardening or in the outdoors. The suit fits loosely but snugs up against the wrist and ankles. The loose fit is intentional, and the suit can be used by pregnant women, as in the photo. Obviously, if you are going to be outside in the woods or garden in Minnesota, you want to add socks and shoes to your ensemble. Disclaimer: I did not get as much of a chance to test out the suit this summer as I had hoped. My new urban garden has fewer bugs than the one I had in rural Minnesota so I did not use the suit much. Still, this is a great idea, and if you are haunted by ticks or mosquitoes on your property, it would certainly be worth a try. The year my husband gave me a long-handled ice-scraper and chopper for Christmas, our daughters groaned. Really, can you get any less romantic? I had requested the scraper and I use it proudly still, though it’s now more than 20 years old. If you garden in the North, you likely have ice and hard-pack snow — on your sidewalk, your driveway, paths you want to keep open — and nothing is as good at removing snow and ice as a long-handled scraper/chopper. Using a scraper will keep your walks clear of ice and safer to walk on, as well as reducing the need for deicer, which can be harmful to gardens. Scraping up ice is also a great way to work out your aggressions about why winter is lasting so darn long! Amaryllis are easy to grow and bring a lot of joy to the cooped up gardener. The holidays are wonderful, but those long dark days of December and January can be a real drag on gardeners. So give a gift that cheers them up. 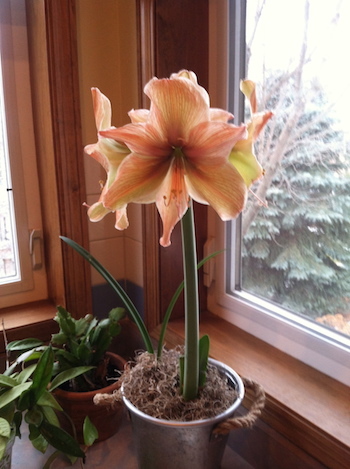 An amaryllis bulb in a decorative pot will grow and bloom for several weeks. A less-expected gift would be some new seed-starting equipment. I love the four-bulb shoplight I got last year — much better than a two-bulber for starting seeds. Or, how about this greenhouse ornament? That’s something a gardener could wish upon during December. And, of course, you could always get them a book.